This facility is provided for various parts of the service structure to store and disseminate information. You should be presented with a box similar to the one below. 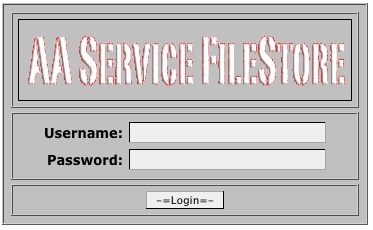 Enter your given username and password, then you should enter your filestorage area. If you have a username ending in '1', then you have 'Level 1' access. You are allowed to use all the facilities of the filestorage area. This password will normally be issued to the ECLO of the service body.. If you have a username ending in '2', then you have 'Level 2' access. You are allowed to to upload a file and to read/download any existing files. This password will normally be issued to the Officers of the service body. If you need to delete a file, please ask your ECLO to do so. If you have a username ending in '3', then you have 'Level 3' access. You are allowed to to read/download any existing files. This password will normally be issued to Members of the Fellowship who are associated with the service body. Applications for storages space can be made by contacting us through this link. When making the request please include the service body that requires it. N.B. This area should not be used as a facility to back up critical information - it is purely designed to help disseminate information.